Teeth whitening is one of the most popular cosmetic options for people who want to brighten their smile and get rid of any stains and discoloration on teeth. At Hillcrest Dental Group, we are in the business of creating beautiful smiles with customized teeth whitening treatment in Petaluma, CA. • Coffee, tea, tobacco, and other dark liquids or foods. 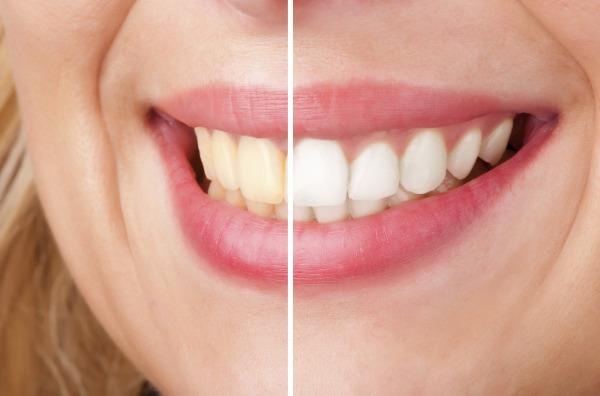 Whitening and bleaching work best on teeth that have been discolored due to food, drinks, or even tobacco use. If you have teeth that are yellowed or grayed to due decay or natural aging, we offer many cosmetic treatments – such as veneers and same-day crowns – that can help you achieve a whiter smile. Whitening can take place both in our cosmetic dental office, or from the comfort of your home. For our in-office procedure, we use Zoom! Chair-side bleaching, which usually takes about an hour, but the results are almost immediately noticeable. Dr. DeBerardinis will cover all aspects of the whitening process, from the system during use, to post-treatment care. The outcome will also be discussed, particularly because results vary from patient to patient. We encourage our patients to discuss their expectations with Dr. DeBerardinis to ensure best results. In-office Treatment - As with all treatments, this whitening procedure requires a thorough teeth cleaning prior to beginning. Zoom! uses a chair-side light that accelerates the whitening process by activating the hydrogen peroxide. The hydrogen peroxide releases oxygen into the enamel and effectively bleaches the stained material, without damaging the tooth’s structure. *Sensitivity during the procedure may occur; minimal heat is produced by the light, which can cause sensitivity for some patients. However, these issues can be treated with the use of standard over-the-counter pain medication and other desensitizing treatments. At-Home Treatment - Our at-home whitening treatments also produce dramatic results with the use of custom trays. The procedure involves using a whitening gel placed in a tray, made just for you. You will wear the whitening trays on a regular basis until desired results are achieved – usually about 30-60 minutes a day for about one week. Hillcrest Dental Group loves creating beautiful smiles with our Petaluma teeth whitening treatment. Contact us today and find out if teeth whitening is right for you!